I know, I know, I only seem to post sad kitty posts these days. But guys, these are sad kitty times. In 1995, 2 days after my 10th birthday, my friend's cat had kittens. I was there for the birth and watched them greedily and blindly try to find their momma's milk. 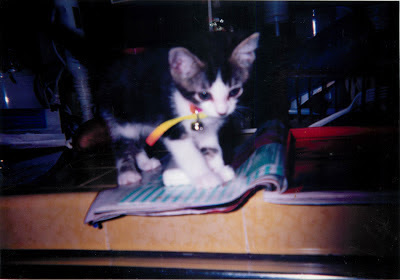 We had a cat when I was very small, but before I turned 6, Oreo had contracted feline leukemia. One day my mom took him to the vet and just never brought him back. I begged to have one of these kittens and my parents said yes. So, I chose one who had a white diamond on his forehead and I named him Diamondhead (like in Hawaii). Then, throgh some convoluted thinking about rare male Calicos, I named him Prophet (because I thought I was going to make bank and "phe" looked prettier than "fi". Well, he never made us any money, but boy did he enrich our lives. Prophet was MINE. He slept with me, kneading my armpit as we cuddled. I picked fleas off his chin and fed him tuna when no one was looking. He got older, fatter, and meaner. Then, when I was away in college, he got a fungal infection in his nose and was very sick. But he crawled away from death's door. Six years later, he had a lump on his leg that the doctor thought was cancerous, so we had one of his front legs removed. Tripod mew gets around just fine and beat death again. While I was away, he became my dad's cat. My dad has been known to say, "Go find my cat, I can't sleep without him." They are best buds and I'm glad that they were able to make this connection. 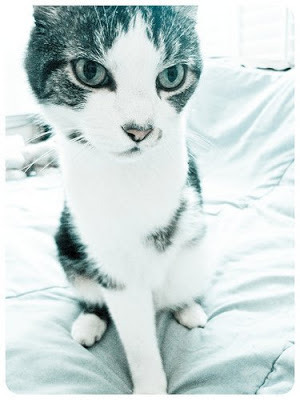 I love all my parent's cats, as well as my own, but any cat owner will understand that sometimes there is a deeper feeling, a connection that doesn't happen everytime. Four years later and we're in the present, where my Prophet is 17 and a half years old - ancient for a cat. He's pretty sick right now though and it might be time to let him go. We'll see what the next few weeks bring. But I sincerely hope I don't lose TWO cats in 2012 or I'll just have to throw a "Life's not fair!" temper tantrum. Over this holiday season, this long weekend, or even this evening - take a moment to live like a cat. To live in the NOW, to enjoy the people aroound you, the food in front of you, and the love in your life. “Guilt isn't in cat vocabulary. They never suffer remorse for eating too much, sleeping too long or hogging the warmest cushion in the house. They welcome every pleasurable moment as it unravels and savour it to the full until a butterfly or falling leaf diverts their attention. They don't waste energy counting the number of calories they've consumed or the hours they've frittered away sunbathing. And send your prayers and good thoughts to my Prophet.